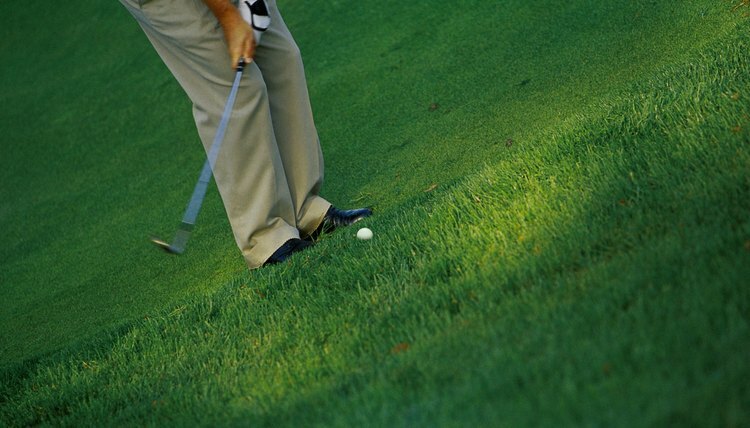 The chipping yips can turn ordinarily confident golfers into timid players around the green. A golfer strides confidently down the fairway to his ball, and he strikes it again authoritatively, but this time it lands just short of the green. He gets to his ball but all that confidence is replaced by abject fear. It's as if he had never played the game before. He has no idea how hard to hit the ball, and there is little hope that he'll hit it close to the flag. In golfers' terms, he has a bad case of the “yips.” If this describes you and your game, there's hope for you if you follow some simple pointers. Determine the cause of your yips. Is it because you are reaching advanced age and the yips are to be expected? Or is there a shot in the past that was particularly gruesome, and you're afraid that it will happen again? Or is it simply that you have never learned the basics of how to chip? Once you determine the cause, you can find a solution. Learn the basics of chipping if a lack of knowledge is contributing to your case of the yips. Address the ball with most of your weight on the side closer to the target and place the ball sightly toward your back foot. Without breaking your wrists, hit the ball with a descending blow and make sure you follow through after the ball is on its way. By no means should you help the ball into the air because that will cause you to hit the shot on the upswing, which often results in a poor shot. Also, remember that the more a chipshot runs, the more control you have over it. Incorporate a drill into your practice time. First, drop a few balls about 5 or 10 yards from the edge of the green. Size up your shot and decide how hard you should hit the ball before you address the ball. Then do so and immediately hit the chipshot. Do that with the rest of the balls, then put them back in same spots as before and repeat the drill. The prevailing theory is that the longer you delay hitting the shot, the tenser you will become. Before long, you will take less time between sizing up shots and taking them, and your shots will become more accurate.